For years, chefs in Maine, and beyond, have fallen in love with the Cold River Gold potato. Why? Because they know it’s versatile, can keep longer than most other varieties, and maintains its unique yellow-gold color, creamy texture, and intense flavor every single time you cook it. Now you can enjoy Cold River Gold in your own home! They mash up fluffy, not dry, and create a creamy texture. When baked, they stay moist – and that light golden color makes it look buttery, even before the butter! They hold together in boiled recipes (soups or canning) and don’t get mushy. They burst with flavor when you fry them and stay light in color every time. Green Thumb Farms is a third-generation family business that’s been farming in Western Maine since 1965. Our agricultural roots lie in the production of the highest quality potatoes — from seed selection to harvest — while our state-of-the-art technology ensures that only the best potatoes go into every bag. Pure, mineral-rich water feeds the plants, while a static water table keeps them steadily hydrated with the water they need. The Valley holds heat like a pocket, which creates a warmer micro-climate that extends the growing period. Sandy soil with no rocks means less bruising for our light-gold potatoes. We know our potatoes so well that we can trace each one directly back to the field where it was grown! Premium products deserve premium packaging. 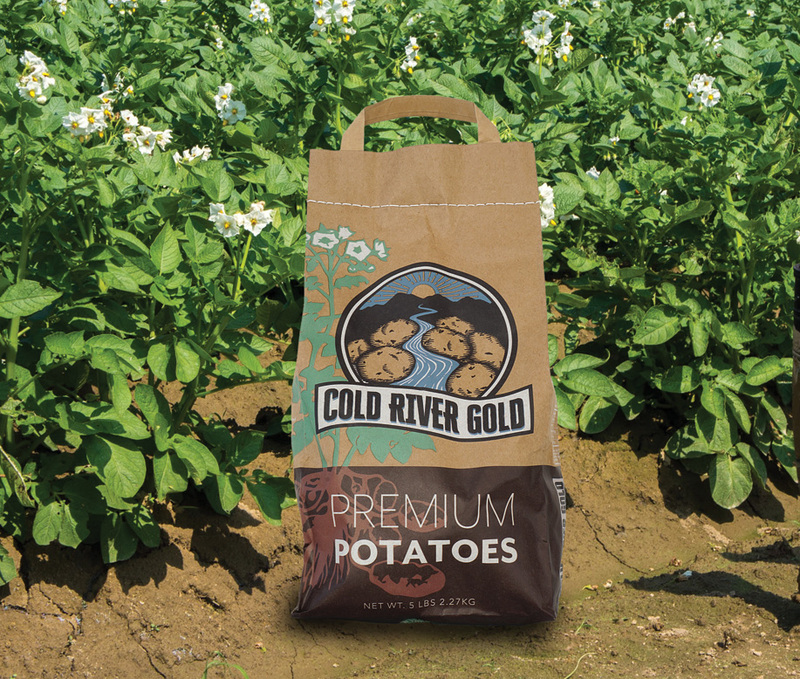 We’re so proud of Cold River Gold potatoes that we designed a special bag so consumers can easily find it at their local store. The visual graphics on our new packaging celebrates the Cold River and the unique growing region of the Mount Washington Valley. Our new bag is made of quality craft paper, similar to what we deliver to chefs. The paper blocks out light better and keeps Cold River Gold potatoes fresher for longer. The air vent — shaped like the state of Maine to celebrate our roots — helps the potatoes to breathe better than standard plastic bags. Cold River Gold Potatoes Now Available at select grocers. Our restaurant partners have been telling us for years how much they love the flavor and versatility of this potato. We listened to them, and now Cold River Gold is available for home cooks to make traditional dishes or experiment with new recipes! Duckfat in Portland, Maine is world-renowned for its Hand Cut Belgian Fries, not to mention the Poutine! In fact, in 2016 they won a #2 spot for best fries in the country. Duckfat Friteshack is a walk-up fry window located in the beer garden at Oxbow Blending and Bottling in Portland. Just like you might find in Belgium or the streets of Amsterdam! Figgy’s Takeout & Catering, located in the West End neighborhood of Portland, uses Cold River Gold potatoes to make their Buttermilk Mashed Maine Potatoes. Noble BBQ in Portland uses our potatoes for their beloved Scrappy Fries, a hot delicious mess of twice-fried french fries, baked beans, cotija cheese, poblano sauce, and butcher’s meat scraps. Wicked Fresh Craft Burgers in North Conway, New Hampshire uses this variety for Hand-Cut Fries (with lots of special house-made sauces), Hand-Cut Wicked Fries tossed with house-grown herbs, and Hand-Cut Wicked Truffle Fries. Cold River Gold potatoes are a healthy addition to any meal, whether it’s a holiday celebration, a backyard barbecue, or Thursday dinner. Traditions matter to us, so we invite you to continue a tradition that you love, or start your own! Pre-heat oven to 350 degrees. Butter a deep 9×13 baking dish. Put milk, cream, garlic, thyme, butter, salt, and pepper in a saucepan and simmer over very low heat for 20-30 minutes. Layer all of the potatoes and cheese into the baking dish, and finish with the cheese. Remove the thyme stems and the whole garlic cloves from the milk, then pour the milk mixture over the potatoes. Cook in the oven for 45-60 minutes. (Potatoes should be soft before you take out.) Let rest for about 15 minutes. Steam or boil unpeeled potatoes for 30 minutes. Peel and slice them across, then put aside and keep warm. Trim the green beans and cook for 12-15 minutes in boiling salted water. Drain and keep warm. Fry the bacon in a pan with the butter, add the onion and continue cooking for 5 minutes. Deglaze the pan with vinegar. Place the potatoes and beans in a shallow dish, add the onions and bacon. Pour the sauce over the top and sprinkle with tarragon. Serve hot. Mix potatoes, eggs, parmesan cheese, garlic, salt, and pepper. Spread mixture on a greased cookie sheet or ungreased pizza stone. Place sliced onions, tomatoes, celery, and broccoli over potato mixture. Sprinkle with bacon bits and shredded cheese. Sprinkle with parsley for garnish. Bake at 350 degrees for about 30 minutes. Serve warm. In a large pot of about 48-ounces of water, add oregano, sweet paprika, both kinds of chili powder, cumin, and beef bouillon. Let simmer. In a separate skillet, brown 2 pounds meat with 1 Tablespoon vegetable oil until meat is light brown. Drain and add to simmering spices. Continue until all meat has been browned, drained and added to simmering spices. Sautée finely chopped onions and garlic in 1 Tablespoon vegetable oil. Add to spices and meat mixture. Add water as needed. Simmer for 2 hours. Add sugar, coriander, hot sauce, and tomato sauce. Simmer for 45 minutes. Assemble on serving platter in the following order: Cover platter with freshly fried and seasoned french fries. Add desired amount of chili. Ladle cheese sauce on top of fries and chili. Sprinkle with diced green onions for garnish, and serve immediately! Look for Cold River Gold in our unique craft paper bags! Our signature chef potatoes have been making headlines for years. Read some of the stories about Cold River Gold and Green Thumb Farms below!